From right after Thanksgiving until Easter, realtors start their open house showings holding listings open each Sunday afternoon from 1:00 pm until 4:00 pm. Please check our blogs often for information and postings regarding time changes, houses that are open and any of information that you may find helpful. 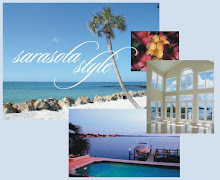 Winter Sarasota residents and vacationers are starting to arrive. The Sarasota restaurants are getting busy; there is more traffice and the movie theaters are pretty full. Check out the Bayfront at Marina Jack's. We have "the Kiss" back on loan at the waterfront, and every day you can see a crowd with their heads lifted to the sky to see the sailor kiss the nurse. If you are driving around on Sundays during the winter season, take Hwy 41 south to Blackburn Pointe Road, cross the swinging drawbridge and take a drive to our Casey Key waterfront homes for sale. Tell us you read about them on our blog! Call for more information on Sarasota homes and condos in waterfront, golf course or country club communities or check our websites for daily updates on property listings. For photos, virtual tours and area information on Sarasota's barrier islands, visit our blogs and find more about homes for sale on Casey Key.